Question for Democrats: Are some candidates too old? 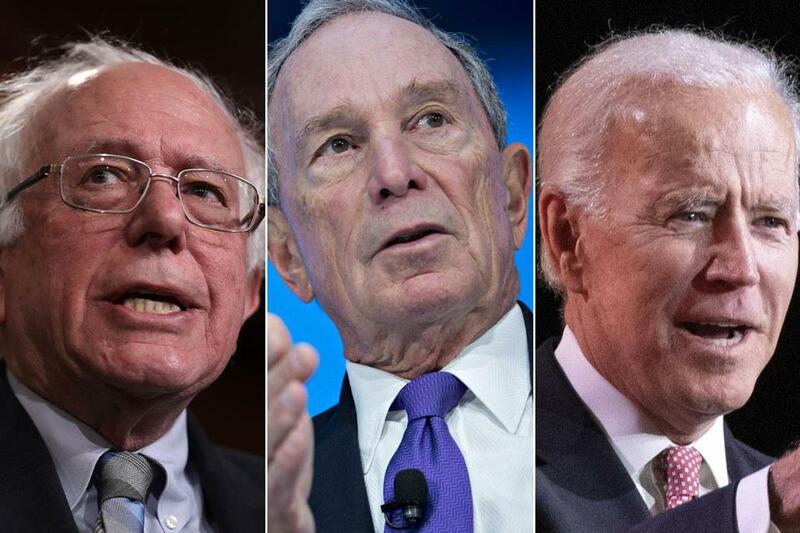 Senator Bernie Sanders (left), former New York City mayor Michael Bloomberg (center), and former vice president Joe Biden are in their mid to late 70s. Fifty-eight years after President John F. Kennedy proclaimed “the torch has been passed to a new generation,” many Democrats long for another young dynamo, one who can harness the energy of millennials to oust President Trump. That could bode ill for the parade of septuagenarians readying their campaigns. But a growing movement of older Americans bristles at the notion that gray hair is a deficit — that the demands of a youth-obsessed culture require candidates with long resumes to step aside. When some candidates say generational change, they hear ageism. Generational change may be the central dynamic in the 2020 presidential campaign. Age is the subtext of every conversation about new ideas versus experience, every debate about whether a candidate can capture the millennial imagination. And there’s a clear generational split in the crowded field of those hoping to replace Trump, now 72, who was the oldest candidate elected to the presidency in American history. Senator Elizabeth Warren of Massachusetts, who formed an exploratory committee last month, turns 70 this summer. Several other prospective contenders are in their mid-70s: former vice president Joe Biden, who is 76; Senator Bernie Sanders of Vermont, 77; and former New York City mayor Michael Bloomberg, 76, to name a few. Another cohort of those eyeing the nomination is at least 20 years younger, including Senators Kamala Harris of California and Kirsten Gillibrand of New York, who are in their 50s, and Senator Cory Booker of New Jersey, former Senate candidate Beto O’Rourke of Texas, and former Obama administration housing secretary Julian Castro, also of Texas, who are in their 40s. At the same time, the electorate’s demographics are changing. An analysis of census data by the Pew Research Center found that millennials and Generation Xers — people ages 18 to 55 — together cast nearly 70 million votes in the 2016 presidential election, a majority of the 137.5 million total. “Millennials are emerging as the dominant force in American politics and will soon supplant baby boomers as the group that decides elections,” said state Senator Eric Lesser, 33, a Longmeadow Democrat who worked as an Obama aide and runs a millennial caucus in the Legislature. “And they’re fed up that everything in their lives has changed — the way they work, the way they shop — except government” and its inability to solve problems. But some advocates for older people object to the notion that the seventysomethings are yesterday’s news, or are simply “too old,” as some activists have complained. Voter preferences don’t always hew to generational lines. Sanders racked up margins of more than 2 to 1 among millennials in his antiestablishment campaign against Hillary Clinton in the 2016 Democratic primary. And while young voters in the November midterms also powered insurgents who won seats in the House like Alexandria Ocasio-Cortez, 29, of New York City, and Ayanna Pressley, 44, of Boston, they were joined by many older voters, especially women and people of color. Still, a surfeit of older candidates could be a problem for the Democrats, who need to electrify the party’s base in the next presidential race. Rather than tap into that sentiment openly, younger candidates will make the appeal obliquely, he said. The mayor of South Bend, Ind., Pete Buttigieg, 37, who launched a long-shot campaign for president last week, is appealing explicitly to fellow millennials by calling for “intergenerational justice” and stressing issues, like school shootings and climate change, that resonate with young people. But candidates have to be careful in making generational arguments. Representative Seth Moulton, 40, of Salem, who’s also weighing a presidential run, was roundly criticized by Democratic loyalists when he called for a “new generation of leadership” in initially opposing the bid of Representative Nancy Pelosi, 78, a woman with decades of experience, to be House speaker. One lesson: Many voters don’t see women, largely absent from the power structure until recently, as part of the old guard. Youthful Democrats who can draw a generational contrast more artfully have been rewarded in presidential races over the past decades. Kennedy was 43 when he was elected president in 1960, while Bill Clinton was 46 when he won his race in 1992, and Barack Obama was 47 when elected in 2008. All of them defeated older Republican candidates — and succeeded older Republican incumbents. “There’s a compelling argument for a younger candidate,” Lesser said. But he added that ideas for creating opportunity and improving people’s lives matter more to millennials than age. But Americans over 65, a bloc of about 50 million people who are among the most reliable voters, are dealing with their own issues, including workplace discrimination and financial stresses, that some believe aren’t fully understood by younger candidates. While they benefit from Social Security, one of the few government programs that enjoys a sterling reputation, they worry about health care — a concern Democrats traditionally exploit during election season by warning voters that Republicans want to cut Medicare. “From my perspective, the concerns of older persons aren’t very well addressed in the general population,” said Jack Kupferman, president of Gray Panthers NYC, an advocacy group. Looking at the business world, Harvard professor Rosabeth Moss Kanter said younger entrepreneurs and managers bring innovations vital to commercial success. But she also finds value in “adult supervision,” especially in the political realm. Kanter cited Pelosi, 78, who she said channels her experience into effective action. “There’s a lot of feisty energy that in another era might have been put out to pasture,” she said. A president doesn’t have to be young to “make room for a new generation’s fresh thinking,” she added. It’s available for hire by smart leaders. “Every White House is full of young fresh idea people running around,” she said.